Systems contractors can provide real value in helping enterprises to reduce complexity, and truly unify their communications. Acano’s platform achieves this by delivering one user experience across every screen. With enterprises large and small realizing how unified communications can have a positive impact on operations, supply chain management, workflow and collaboration, UC as a concept is not necessarily a tough sell. Deployment, however, is another issue, and systems contractors can present themselves as trusted partners in helping their clients navigate through the challenges associated with taking advantage of everything this technology offers. While IT departments in large organizations may oversee UC deployment in-house, Satterfield said that systems contractors are sought out for their specialized knowledge. 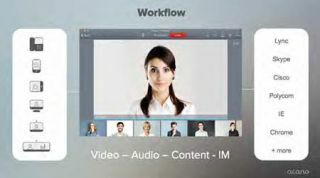 “They’re using AV integrators because they have a level of expertise that’s higher than theirs in the deployment of these tools, and an understanding of how to position these tools within the enterprise to drive the rate of adoption,” he said, noting that systems contractors play a significant role in ensuring that UC, once deployed, is actually used within the organization. But John Greene, vice president of sales and marketing at Advanced AV, a systems contractor based in West Chester, Pennsylvania, argues that the conversation about AV/IT convergence is over—or should be. “It’s a topic that’s greater than 10 years old; the only difference is that now it’s actually happening,” he said. “If you do not have certain skillsets—and in some cases, it’s not just IT skillsets [that are required], but telecom [skillsets] as well—then there is something wrong.” However, he also believes that AV integrators have acquired these skills and hired the right personnel in order to be able to deliver on these projects—at least those who wish to continue growing. For Satterfield, the issue isn’t that systems contractors cannot find the expertise required for IT-heavy projects, it’s capturing the margins necessary to support that expertise. “The margins that they get on AV integration are substantial, compared to the margins they get for desktop deployments and infrastructure, which don’t look as strong,” he said. Asmund Fodstad, executive vice president at Pexip, believes that one thing UC offers systems contractors is “a fantastic opportunity to sell more services,” he said, which, in turn, can be transformed into recurring revenue. But before jumping in to UC, he urges systems contractors to think about their business model carefully. “They need to think about volume, scalability, if they need to offer more technical support and where they want to play.” For example, you may consider becoming a Microsoft partner, but you need to decide if the investment is going to bring in a reasonable return. Crestron RL, together with Microsoft Lync, is changing room-to-room video conferencing at Adventist Health System. Adventist, a non-profit, faith-based healthcare organization that operates facilities within the Southern and Midwestern regions of the United States, has been running nearly all of its communications on the Lync platform, using it for instant messaging, file sharing, screen sharing, telephone, and peer-to-peer audio and video conferencing. Now, with the addition of Crestron RL, they can carry group-to-group videoconferences on Lync as well, dramatically improving collaboration and simplifying meeting setup. “We have almost 45,000 people actively using Microsoft Lync, so we’re really excited to be implementing Crestron RL,” said Chris Stone, Adventist’s Telepresence and AV Manager. The organization’s mission requires close communications between physicians, managers, technicians and staff at Adventist, so they have long employed video conferencing to bring people from different locations together for meetings. Today, Adventist has about 100 video conferencing rooms, plus plans to add as many as 50 more this year. Stone said they expect to continue to use the existing Cisco platform, but they have also wanted to add Lync-based video because Lync carries virtually all of their other communications. It’s a good time to add these rooms, because the price of videoconferencing solutions has dropped dramatically. Today, a fully equipped Crestron RL system is about half of what Adventist paid just a year ago for a videoconferencing setup. According to Stone, the Crestron RL system offers more capabilities, is easier to use and has the same or better video quality. PG&E installed a Jupiter Systems Canvas to maintain visibility over the electrical grid. The new Fresno Pacific Gas & Electric (PG&E) control center is the first of three new control centers that will manage PG&E’s more than the 140,000 miles of electric distribution. It will be responsible for monitoring and managing the electrical distribution grid for more than 16 million power customers from Stockton to Bakersfield. The heart of the facility is a high-security control room, the “quarterback for the system,” where operators at computer stations will keep an eye on power demand and circuit problems in real time, enabled through smart grid technology. Employing Jupiter Systems’ Canvas collaborative visualization solution, PG&E’s operations team can maintain total visibility into the trends and power demands affecting California’s electrical grid while also delivering enhanced features to quickly process and analyze data in the event of outages, for a more secure, efficient and responsive smart grid. The Canvas solution gives PG&E an unprecedented level of visibility for its control room operators while time-sharing that visibility with its remote field teams. PG&E’s service crews travel in vehicles equipped with GPS systems, which communicate with the operators back at the command center, enabling PG&E to get visibility into which service crews’ area are available and closest to outage areas at any given time. PG&E’s service crews will also be able to access and interact with the same visual information and data that is available to operators in the control center, making for more efficient and collaborative efforts to maintain the power grid and deliver reliable service.